Does anyone know if the positioning of these lines has remained the same over the years? If so, whereabouts would this stand if it were today ?? Only the platforms have disappeared over the years. The bridge shown is the present road bridge and the two men are on the "down" platform presumably waiting for a train to Skipton. The building at the top of the ramp was the booking office. In the late 1950s/early 60s, I used to leave my bike in the store room (through the arched door under the main building) when travelling to school at Bradford by train. The gable end seen under the road bridge is the northern end of Kildwick goods shed. This is the New Station. 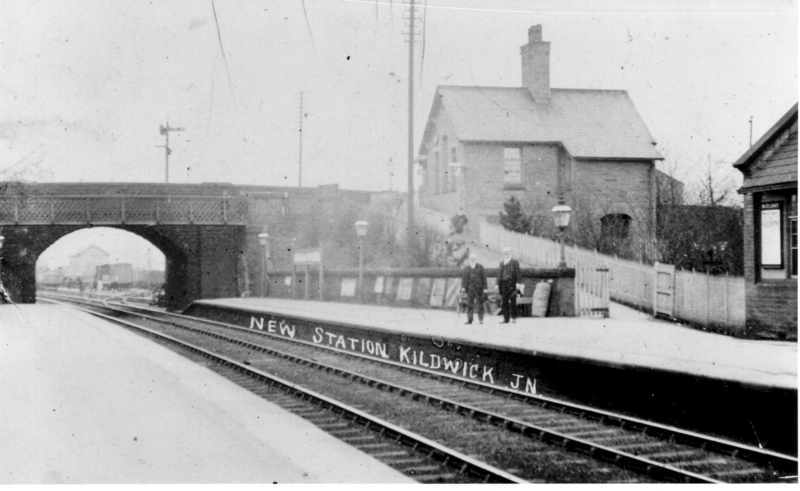 The old station was the building adjacent to the level crossing, which later became the station master's house. In this picture the goods yard can be seen under the arch. Coal trucks were unloaded here for domestic fires. Further down the yard was the corn store and crane where goods were hoisted into farmer's/merchant's wagons. On this side of the track was a siding into the gas works. Wagons were pulled into the gas works by a cable winch. I have additional photographs from 1960s. Does anyone know why the station closed! The taller of the 2 figures,looks a little like my g grandfather. He was the signalman here and lived in Station house.